Michele Romano of ISICO in Milan, Italy, is one of the world’s leading experts in scoliosis exercise programs. He is the current President of SOSORT (Society on Scoliosis Orthopedic Rehabilitation Techniques), and one of the lead instructors of the Scoliosis World Masters Program. He has published numerous research articles on the science behind scoliosis exercises. The CLEAR Scoliosis Institute is honored to host this very special guest blog by Dr. Romano, and to feature him as our keynote speaker at our upcoming Advanced Workshop (which anyone may attend) on October 6th & 7th at the Mall of America in Bloomington, Minnesota! 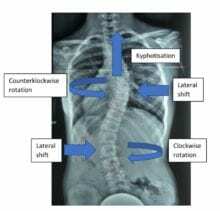 The Scientific Exercise Approach to Scoliosis (SEAS) is a conservative treatment method for scoliosis patients, based on the use of specific exercises. The theme of this short article is not the description of the approach nor the list of articles published with evidence of its effectiveness. The article’s focus is a brief explanation of some features of the exercises that are used and which are some of the characteristics that distinguish it from other methods of treatment based on specific exercises. The first statement is, that SEAS exercises are designed with the concept of functionality and best possible compliance. Exercises should be performed in a physiological pose because scoliosis is a chronic disease. In cases of curves which do not require the surgical approach, a conservative treatment performed correctly allows to stop its evolution, to recover (if possible) a portion of the misalignment and to bring the patient to the end of bone maturation with good hope of avoiding worsening in adulthood. At the same time, we are aware that no curve is completely straightened and that at a more advanced age even a curve correctly treated may begin to deteriorate when the quality of the structures will show the natural decadence associated with aging. So, the treatment cannot be completely and suddenly forgotten at the end of bone maturity. One of the main important features of SEAS treatment is the Active Self Correction. This concept differs from the classic Self Correction that indicates a series of movements which the patient performs alone to obtain the best possible spine realignment. Active Self Correction is always performed by the patient, but it is performed without the help of artificial positions of the body or by external tools. The purpose of the SEAS is not necessarily to teach the best possible correction. The best possible correction is the result of the movements able to obtain the maximum reduction of the curve. This maximum curve reduction can only be achieved by placing the body in non-physiological postures. As the final purpose of the SEAS Approach is to teach the self correction that the patient can use in everyday life, the self correction of the SEAS approach is not the best possible, but rather it is the best possible correction that is usable and achievable in daily life. It must be possible to perform the self correction without external aid. This requirement is a direct consequence of the first. The use of self-correction in day-to-day work can only be possible if its achievement is possible without external aid. These aids may be a specific body position or the use of instruments such as poles, asymmetric supports for the arm or the pelvis. These aids are not to be considered negative if they are used only for learning the correction motion but are to be abandoned as soon as the patient begins the combination of the self correction with the exercises. From now on, external aid is an obstacle for integrating the correction in daily activities. Exercises should not be boring! The conservative treatment of scoliosis is a very long process and requires patient adherence. This variable may be due to a subjective or objective difficulty. Poor adherence to treatment due to poor personal engagement is a problem we always face and that does not have a real solution. Instead, failure to perform treatment due to its objective difficulty is an element that deserves our attention. Even if the best treatment in the world is created, a treatment which always works but in order to be accomplished involves a number of complex difficulties to overcome, the result will not be achieved. For example, if the therapy is too expensive, not all patients will be able to do it. If not well-understood, not all patients will be able to perform it. If it is a tough, tiring or boring therapy, only the most motivated, responsible, and committed to the sacrifice will be treated. This is not what a good health professional should propose. One of the features of transversallyeffective therapy is that it can be practiced by the largest number of patients. A very important characteristic of the SEAS approach is that there is a clear difference between self-correction and exercise. In other conservative treatment methods, exercises are movements that the patient performs to achieve the best possible correction and keeps for a number of seconds to improve the stability of the column. In the SEAS approach, exercises represent the tools to use to train the patient’s ability to not lose the correction. Exercises are therefore performed with two objectives that appear paradoxically conflicting. The two goals seem to be contrasting, but in fact, as with any training program, improvement can only be achieved by challenging the function that you want to improve. My answer is very simple: This depends on what we want to teach the patient. If our treatment is very complex, only one session will probably not be enough and will require a first intensive treatment period. It is different in the case of a treatment whose difficulty depends on the patient’s ability to perform it properly. This is a specific feature of the SEAS approach. Correction and exercises do not depend on the classification of the curve but on the specific situation of the individual patient. The specific situation is represented by the characteristics of the curve but also by the patient’s ability to correct it. If my goal is to teach the best correction possible, for example, a three-dimensional correction and I’m not satisfied until this is achieved (or is expected to be achieved), one session will definitely not be enough and perhaps not even an initial intensive treatment. Many times, I have seen teaching perfect corrections all but humanly impossible to perform. The SEAS approach does not persist in teaching the perfect correction. This is theoretical correction. The practical correction that is taught to the patient is the best possible correction that the patient is able to perform at this time. The exercise program will be run with the aim of training the patient to perform and maintain this correction until the next session, in which he will try to make it more complex and closer to the theoretically better correction scheme. Learn more about SEAS on ISICO’s website. For more information about the Advanced Workshop at the Mall of America where Michele Romano will be presenting, send us an e-mail at care@clear-institute.org.